The Edison Diamond Disc Record is a type of phonograph record marketed by Thomas A. Edison, Inc. on their Edison Record label from 1912 to 1929. They were named Diamond Discs because the matching Edison Disc Phonograph was fitted with a precision-made semi-permanent diamond stylus for playing them. Diamond Discs were incompatible with ordinary disc record players, the disposable steel needles of which would damage them while extracting hardly any sound. Uniquely, they are about 1/4 inch (6 mm) thick. 80 rpm 'Diamond Disc' records. Note the thickness of each record. Edison had previously made only phonograph cylinders but decided to add a disc format to the product line because of the increasingly dominant market share of the shellac disc records (later called "78s" because of their typical rotational speed) made by competitors such as the Victor Talking Machine Company. Victor and most other makers recorded and played sound by a lateral or side-to-side motion of the stylus in the record groove, while in the Edison system the motion was vertical or up-and-down, known as "hill-and-dale" recording, as used for cylinder records. An Edison Disc Phonograph is distinguished by the diaphragm of the reproducer being parallel to the surface of the record. The diaphragm of a reproducer used for playing ordinary records is at a right angle to the surface. In 1929 Edison also produced a short-lived series of ordinary thin lateral-cut "needle type" disc records. A 1918 Diamond Disc Record with Samuel Siegel on mandolin and Marie Caveny on ukulele. 1915 newspaper ad for the product. The record industry began in 1889 with some very-small-scale production of professionally recorded wax cylinder records. At first, costly wet-cell-powered, electric-motor-driven machines were needed to play them, and the customer base consisted solely of entrepreneurs with money-making nickel-in-the-slot phonographs in arcades, taverns and other public places. Soon, some affluent individuals who could afford expensive toys were customers, too. By the late 1890s, relatively inexpensive spring-motor-driven phonographs were available and becoming a fixture in middle-class homes. The record industry boomed. At the same time, the Berliner Gramophone Company was marketing the first crude disc records, which were simpler and cheaper to manufacture, less bulky to store, much less fragile, and could play louder than contemporary wax cylinders, although they were of markedly inferior sound quality. Their quality was soon greatly improved, and by about 1910 the cylinder was clearly losing this early format war. In 1912, Thomas Edison, who had previously made only cylinders, entered the disc market with his Diamond Disc Phonograph system, which was incompatible with other makers' disc records and players. Like cylinder records, the sound in a Diamond Disc's groove was recorded by the "hill-and-dale" method, as variations in the depth of the groove cut. At that time, with the notable exception of Pathé Records, which used yet another incompatible format, a disc's groove was normally of constant depth and modulated laterally, side-to-side. The vertical format demanded a perfectly flat surface for best results, so Edison made his Diamond Discs about one-quarter of an inch (6 mm) thick. They consisted of a thin coating of a hard plastic virtually identical to Bakelite on a core of compressed wood flour, and later also china clay. 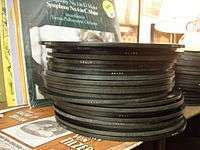 With very rare exceptions, all were about ten inches in diameter, but they used a finer groove pitch (150 threads per inch, or "TPI") and could play longer than ordinary ten-inch records—up to five minutes per side. Among their advantages over the competition, they were played with a so-called "permanent" precisely shaped diamond stylus, while lateral-cut records were played with a ten-for-a-penny steel needle that quickly wore to fit the groove contour and was meant to be replaced after one use. A feed screw mechanism inside the player moved the reproducer across the record at the required rate, relieving the groove of that work and thus reducing record wear. The playing speed for Diamond Discs was specified at exactly 80 revolutions per minute, at a time when other makers' recording speeds had not been standardized and could be as slow as 70 rpm or even faster than 80 rpm, but were typically somewhere around 76 rpm, leaving users who cared about correct pitch to adjust the playback speed for each record until it "sounded right". Above all, there was, and still is, general agreement that the Diamond Disc system produced the clearest, most "present" sound of any non-electronic disc recording technology. Although Victor's Victrolas and similar record players could not play Diamond Discs (at best, only very faint sound would be heard, while the crude steel needle seriously damaged the groove) and Edison Diamond Disc Phonographs could not play Victor or other lateral-cut discs, third-party suppliers came up with adapters, such as the Kent adapter, to defeat this incompatibility, but typically with less than optimal sound quality. The Brunswick Ultona and the Sonora were the only non-Edison machines that came from the factory equipped to play Diamond Discs as well as Victor and other "needle-type" records, along with Pathé's odd "sapphire ball" hill-and-dale format, but Edison discouraged all such alternatives by cautioning on some of his record sleeves: "This Re-Creation should not be played on any instrument except the Edison Diamond Disc Phonograph and with the Edison Diamond Disc Reproducer, and we decline responsibility for any damage that may occur to it if this warning is ignored." Diamond Discs enjoyed their greatest commercial success from the mid-1910s to the early 1920s, with sales peaking in 1920. Although they arguably had better audio fidelity, they were more expensive than and incompatible with other makers' products and ultimately failed in the marketplace. Not least among the factors contributing to their downfall was Thomas Edison's insistence on imposing his own musical tastes on the catalog. As an elderly man who favored old-fashioned "heart" songs and had various idiosyncratic preferences about performance practices, he was increasingly out of touch with most of the record-buying public as the "Jazz Age" 1920s got underway. It was not until mid-decade that he reluctantly ceded control to a younger generation. In 1926, an attempt at reviving interest in Edison records was made by introducing a long-playing Diamond Disc which still rotated at 80 rpm but tripled the standard groove pitch to 450 threads per inch by using an ultra-fine groove, achieving a playing time of 24 minutes per 10-inch disc (12 on each side) and 40 minutes per 12-inch disc (these were the only 12-inch Diamond Discs ever sold to the public). A special reproducer and modified feed screw mechanism were required to play them. There were problems with skipping, groove wall breakdown, and overall low volume (about 40% of that of the regular Diamond Discs). Only 14 different "Edison Long Play" discs were issued before they were discontinued. In August 1927, electrical recording began, making Edison the last major record company to adopt it, over two years after Victor, Columbia, and Brunswick had converted from acoustical recording. Sales continued to drop, however, and although Edison Diamond Discs were available from dealers until the company left the record business in late October 1929, the last vertically-cut direct masters were recorded in the early summer of that year. Priority had been redirected to introducing a new line of Edison lateral or so-called Needle Type thin shellac records, compatible with ordinary record players, but although their audio quality was excellent this concession to commercial reality came too late to prevent the demise of Edison Records just one day before the 1929 stock market crash. 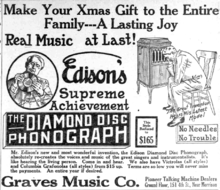 ↑ "Tim Gracyk's Phonographs, Singers, and Old Records -- Edison Diamond Discs: 1912 - 1929". Gracyk.com. Retrieved 18 September 2014. ↑ "Very rare reproducer made for Victrola machines to play Edison DD records.". Pat.kagi.us. Retrieved 18 September 2014. ↑ "Tim Gracyk's Phonographs, Singers, and Old Records -- Brunswick Phonographs and Records". Gracyk.com. Retrieved 18 September 2014. ↑ "EDISON DIAMOND DISC MANUFACTURING PROCESSES - By Paul B. Kasakove / THOMAS A. EDISON, INC.". Mainspringpress.com. Retrieved 18 September 2014.